The Westwood Hills home at 393 Dalkeith Ave., LA CA 90049 received a price reduction this week of 4.13% or $115,500, down to $2,679,500. 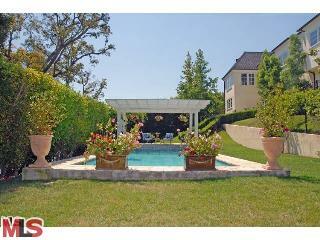 This home was listed 172 days ago on 9/11/09 for $3,095,000 and has received 4 price reductions so far. 393 Dalkeith is also known as 11261 Montana Ave as it sits right on the corner of Dalkeith and Montana. The corner lot is rather large, over 16,000+ sq ft, and features a pool, covered patio and an expansive grassy area. Inside, the home is in move-in type condition and features an oversized gourmet kitchen that most people would love. According to the MLS, the home is a 5 bedroom / 4.5 bath, 4,199 sq ft of living space on a 16,417 sq ft lot.